While alcohol may help you get to sleep or even cause you to blackout, it really throws off your normal sleep cycle. All sleep is not created equal and enjoying just a few drinks before bed has been proven to negatively impact your quality of sleep. Sleep is the only chance for your brain and body to relax, which involves some mandatory Rapid Eye Movement, or REM Sleep. When you drink alcohol before bed, you go straight into a deep sleep and potentially miss out on REM sleep, the part of sleep that actually revitalizes you. This chart will not be precise for everyone, but clearly shows the general principle. 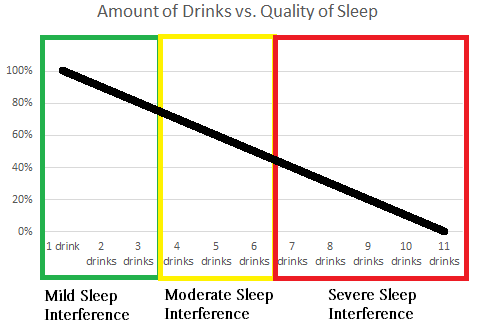 The more drinks you have, the worse your sleep quality will be. REM is what makes sleep worthwhile. REM Sleep happens usually after 90 minutes of deep sleep, but alcohol can cause you to remain in deep sleep and not go through your normally scheduled REM cycles. Alcohol is also a diuretic, and such drinking it before bed time will cause for your REM sleep to be interrupted by trips to the toilet or even the kitchen for a glass of water. Higher intake of alcohol will also cause extreme relaxation of your body’s muscles according to Dr. Alina Baciu, thus making the consumer prone to snoring and sleep apnea. Doesn’t sound healthy, right? That’s because sleep apnea can be a fatal event. Too much alcohol can also cause you to vomit during sleep, which can also result in death. Alcohol should not be used as a sleep aid. While it might seem like a great idea to have some alcohol before getting into bed, it is generally not advised. People with insomnia are at a higher risk of becoming dependent on alcohol as they believe their quality of sleep has improved. Most people who go to bed under the influence wake up after a few short hours, feeling tired and un rested. You will feel the affects of how alcohol affects your sleep and the quality of life the next day. College Students – Don’t Drink and Sleep! If you want to perform your best for tomorrow, don’t drink anything with alcohol the night before. Whether you are preparing for a test, or are an athlete – definitely do not drink before the big day. Your sleep will be affected and you will not perform as well as you would have if you had slept better. Making sure you get a full night of quality sleep has been proven to increase test scores, as well as athletic performance. While this may not be known to some, alcohol can be the culprit behind a lot of sleepless nights in the USA.